It’s been over a week a while since THYME’s debut album first 9uality, and chances are pretty good that if you liked Fly Away, you’ll like at least 9 of the 12 tracks on the disc. That’s not because most of the songs sound just like Fly Away, but I think that you’ll find a lot of the elements (or 9ualities?) that made Fly Away likeable throughout the album. I’m not a fan of speaking of a performer’s or group’s “sound” and treating it like some ethereal concept, so here goes my attempt at expressing THYME’s appeal in marginally more tangible terms. The first thing you ever hear in Fly Away is thyme (or Kamiyama Sayaka). I personally think that she’s not mixed, but speculation aside, there’s no disputing Western influence on her singing. She can lilt, she can drawl, can casually slide up or down to her target pitch, and imitate the throaty rumble you get when putting a brass instrument at the edge of its dynamic range. Apart from these country and blues techniques, thyme generally carries a strong rhythmic line, driven home through varying combinations of the above skills, range jumping, and a choice of lyrics that lend themselves well to accenting and small lifts. The songs emphasize thyme’s vocal abilities, but not in a way that she’s allowed to dominate throughout. Strong harmonizing vocals have a shading effect, and in numerous instances backing instrumentals have short but prominent figures. Occasionally, an entire counter line is introduced in the right or left audio channel. And in babycar, her voice is run through a slight mute and tighten to recreate classic country dance hall. I have no idea if that’s the right term. I know, “babycar” isn’t a word. One contentious result of all this Western influence is the insertion of engrish, of which thyme’s pronunciation track record is … mixed. Let’s leave it at that and go on to track specific notes. 01. Seiten (Fine Weather) was an indie song of theirs that they re-recorded for the album. Bringing in the string ensemble always seems to open up the acoustic landscape, and dropping them in and out is used to good effect heading into the final iteration of the chorus. Extended outro, with a new line closes off an atmospheric opener. 02. Hello is another atmospheric piece, this time with a courageous character, and some country inflection courtesy of the vocalist. Rhythmic right channel guitar in the second verse just adds to an already driving performance. The extended chorus that closes the track has lyrics that line up really well. Strings drop in and out, this time in a supporting to role to back a short detached line. 03. Our Rock Star has a very obvious guitar line, a short and insistent motif that begins on the right and ends up on the left. In the second verse, a counter line is added on the right. Obvious bass movement in the chorus. Harmonic progression is strong throughout the album, but a solid base (bass, too) and good balance is always appreciated. 04. forever we can make it! demonstrates the band’s ability to straight up rock out. Classic rock n’ roll riff in verse supports more contemporary phrase-length key modulation. Detached style in bridge creates some variety in texture. thyme likes to clip her words short in this one. She arguably looks the most mixed in the PV for this track. 05. Drive has ramp pitch slides in abundance. Echo effect plus lengthened slides make the bridges prominent passages. Simple rhythmic elements skew the spotlight towards thyme; this is very much a technical display for her. One of her more “gutsy blues” performances of this album. 06. Fly Away, Natsu no Sora’s OP, and what piqued my interest in the first place. Call and response between instrumentals in second verse. Slightly developmental bridge section ahead of the final chorus that starts out in the dominant key (probably?) that winds up in the home key in time for the last phrase of the song. What can I say? I like short modulations between major and minor, major to minor chord transitions, and deceptive cadences. The way they’re pulled off — almost choral backing, a descending bass figure, or the fresh striking of a guitar chord to punctuate the change — doesn’t hurt either. And somewhere in all that, there’s a piano. That’s just gravy. 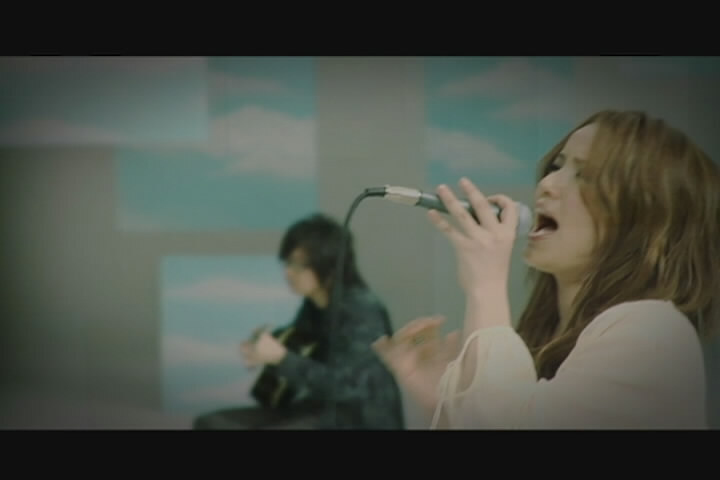 Teppei Shimizu, the guitarist to thyme’s left (screen right) in all three of their PV’s, always seems to be singing along, and although he is credited with some backing vocals, I haven’t ever picked him out. 07. 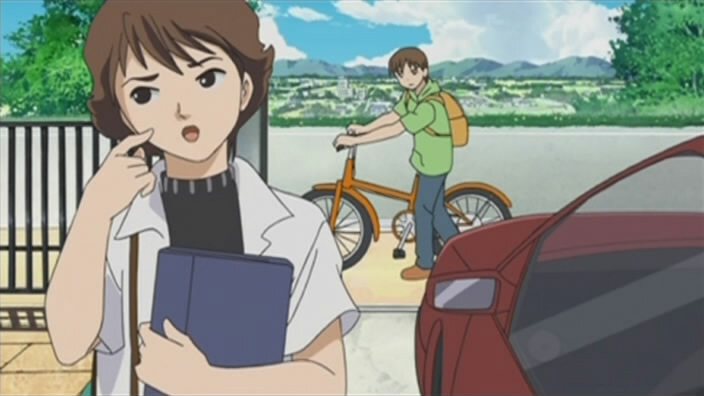 I’ll be back is notable for having the most prominent use of engrish. Heavy use of thick chords in time with snare drums. Other than that, it’s whatever kind of rock that was popularized in the mid-90’s, of which I’m generally not a fan of. 08. The LAST DAY [sic] is like Drive, with a more balanced arrangement that is still sparse enough to put the spotlight back on thyme. With more drive than Drive, instrumentals have punctuating roles, and thyme navigates a line that alternates between smooth verses and snappy, fast-talking choruses that’s pure syncopation. You hardly notice the walking tempo upon which all this activity is built upon. 09. babycar is the neatest track in the album. It’s not the richest song of the bunch, and without an extended bridge and outro, it’s also the shortest of the album. But in 3 minutes and 16 seconds, THYME has managed to nail history. They’ve brought in all the right instruments for a laid back country blues number. As noted before, thyme’s voice is filtered through something resembling a large dance hall, the result being an echoey croon. Great piano part here, too, managing to keep things lazy without going into swing eighths. 10. My Life, the resident pensive track, is not dramatic, but it is richly arranged. Woodwinds gently mark out the beat during verses, and a myriad of brief figures layer weave enough texture to get lost in. 11. Humming Bird features a violin in a fiddle part, the first thing coming to mind being Vienna Teng’s Harbor. While not as up-tempo as Harbor, things are still kept pretty light. In addition to filling in little gaps and playing response to calls, the violin has a wavering line that adds a bit of weight during the chorus. 12. Wonderland brings out the piano and strings one last time for a casual stroll along sun-kissed sidewalks. Curious that the high hat is relegated to the right channel. Anyway, cross-channel reverb adds to atmosphere, and strings add a pulsing effect, like soft steps. thyme has a really nice bounce in her voice throughout this song, but it shines in one particular section. In a bit of development midway through, she breaks out into a conversational stretch, as if straight out of a musical. It’s the equivalent of breaking into song in the middle of the street, and yet it’s fitting, not awkward. Facilitated by a smooth transition, thyme talks fast but with a lot less snap and a lot more round, navigating her line with a soft bounce. With a giggle, the song, and album, comes to a close. first 9uality is all about accessibility, but beneath those instantly recognizable forms and styles is a meticulous attention to detail and a gutsy attitude geared towards doing cool stuff. The overall mood is sunny and coy, and for me is a solid contrast and change from the shadier haunts that is Heart Station. A couple general notes before I go. Hello and Drive comprised THYME’s first single. They have been touched up for the album, with Hello getting cleaner separation at the end, stronger strings, and giving the comping guitar the right channel for the verses. For Drive, thyme gets the echo effect for the bridge. I think they’re all great changes, and Hello in particular is noticeably clearer as a result. The cheapest shipping option offered by CDJapan really does have lead times of up to three weeks. I didn’t believe it at first — Amazon’s free shipping option delivers in less than a week most times — until my order arrived just short of that. With only about 13 minutes and change in PV’s, you’d think that the DVD would contain progressive video, but no; it’s all interlaced. This is even more incentive to encode, something which I haven’t done in a while. Speaking of things that go kaboom, Hikki Station closed and I didn’t even know until now. So dependent have I become on feeds as event triggers that visiting a site on a whim has become a Rare Event. The first is that perhaps my reading habits are different from most, having been influenced long ago by an article about how to write for sites (or blogs, if you want to call them that). I’ve since forgotten the URL, but I remember that it emphasized the feed as an event queue, and as a kind of ersatz push (it looks like push to you but your reader is actually polling). The implication is that, for those who consider their feed as the primary delivery mechanism, you should never announce that you are going away, you should never apologize for being busy (which is really the same thing), and you should never proclaim that you are back. If you are going on hiatus, stop writing. If you are back, start writing. Feed readers — and by extension your human readers — will never forget you. I’m under no illusions, though; people can and do remove feeds from their readers. On the other hand, “Display only updated” mode makes it easy to forget that someone has stopped, and when they come back it’s as if they’d never left. Such are my own working assumptions. But just as incoming data should trigger an interrupt, so should a closed pipe or socket. Teardown is the final event, is it not? Maybe it even deserves to raise an exception. I think it’s the responsible thing to do, because no one’s a fan of unintentional memory leaks. Whether or not the user chooses to release resources at that point is up to them. Hikki Station and U.Blog more or less covered the same space, with U.Blog being quicker to market and Hikki Station having a better presentation (i.e. site layout), but it was the translations that were Hikki Station’s selling point. I’d add to that the subtitled videos but those were taken down about as quickly as they were put up. If nothing else, I’d like to see that MUSICA 2007 interview one day archived and put on a free host. Of course, that is Sanosuke’s decision. I know that this is sense of entitlement talking, but if, for whatever reason, a site goes dark, I feel that the database should be exported out to a free host. Search engine caches and the Internet Archive can’t do it all. There is something very dissatisfying about the thought of having entire sites squirreled away in a zip file, or worse. Because, it’s not all unreferenced storage, put out to curb for the garbage collector (if that’s how your GC rolls). If in doubt, better to leave things as they are. Storage is cheap, the number of external references could very well be non-zero, and if you ever decide to start again, it’d be that much easier. After all, it’d be as if you had never left. Given the volume of submissions to Jpopsuki, it was nice having an RSS feed to quickly scan the submissions for artists of interest. Unfortunately, that RSS feed has since gone kaboom and there’s no ETA on a fix, so I could have missed out on a bit of excitement. Three Utada Hikaru live performances were submitted, as 1080i MPEG-2 transport streams: Deep River at the 17th Japan Golden Disc Awards, Colors at POPJAM in early 2003 (file date is wrong), and Heart Station at Music Station. Given that HD transport stream captures are common now, the last one isn’t too interesting, but to see five year old footage at 1080i in about as raw a form as one can get, is a bit remarkable in its own right. Prerequisites: an ISDB-S receiver to record the BShi channel, a DVR, plenty of storage in general, and a technically inclined Hikki fan that enjoys collecting her media appearances. In my technologically and monetarily impoverished state circa 2003, I lacked I/O bandwidth, drive storage, and my monitor topped out at 1024×768. When CD-R’s were the primary means of accommodating 700 MB files, HD would have elicited horror, or tears. At the time, 1080i and 48 kHz AAC (or AC3 over here) would not have been worth one CD every 4 minutes. The monetary situation hasn’t changed much, but it’s a good thing Moore’s Law hasn’t either. Maybe it’s not fair to say that those who decided to pull and keep digital satellite streams were ahead of their time, but from my standpoint it certainly feels that way. On a Hikki-related note, this eyelid phenomenon happens to me, too. But since double eyelids are said to be more attractive, maybe it pays to be modestly sleep-deprived? Pointless trivia: DGIndex says that the average bitrate of these 2003 streams is 20 Mbps. Such is the advantage of wideband satellite transmission over 6 MHz terrestrial DTV standards. ATSC tops out at a rigid 19.39265846 Mbps, whereas ISDB-S can stuff two HD channels with its 51 Mbps capacity. This isn’t the same question as “Who is THYME?” (English) Wikipedia seems to have a decent idea of the band, but nary a word on the group’s lead vocalist. This isn’t unusual, and indeed isn’t even a big deal, but then again most other artists don’t use a lower-cased English word for their stage name. It’s a shame that Wiki.ThePPN’s status is in DreamHost limbo. Just throwing that out there. Anyway, my admittedly short search began at the Jpopmusic.com forums, wherein thyme is unmasked as Sayaka Kamiyama (given name / family name order) which…doesn’t mean anything to me. I can go play TF2 or something now, right? Searching for that name leads to a possible kanji writing, along with a photo that seems far removed from what she looks like now. 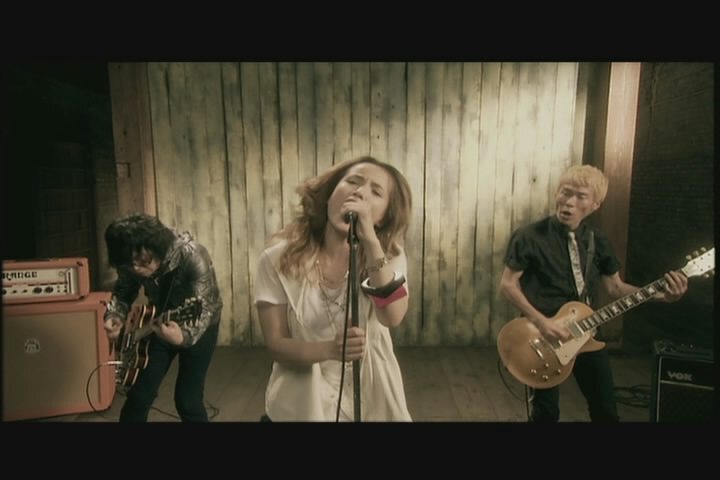 But if you plug 神山さやか into YouTube, you get a recently posted video of THYME promoting their Fly Away single. Although she only refers to herself as thyme in the video, the video itself is tagged with her real name. Continuing on, the Japanese Wikipedia has a brief profile on her, linking her current and past musical careers. I’m loathe to buy too much into what Google Translate says, but it seems that she at least appeared on the now defunct ASAYAN idol search show during 2001, and met with some success judging by the release of 3 singles during 2002. Incidentally, those singles are available on YesAsia. It’d be interesting to hear her, pre-THYME. As for the THYME indie singles? Nowhere in sight. But at least they re-recorded Seiten and Drive for their album. Tying it all together is this Hatena Diary keyword page. Most interesting is that among her favourites she lists four female, Western, singer-songwriters, from whom I think she at least derives her forceful singing style. And I think, that’s really what started me down the trail in the first place. Given that they play into each other, it’s probably a bit of both. But at least Maaya got the role of title character, limited as even that was. Natsu no Sora‘s full OP has one kicker of an outro. I’m such a sucker for strong harmonic progression. Watching the Batanime (or Batmanime), I came across technobabble, and it feels out of place. It’s kind of weird to think that heaps of jargon wouldn’t belong in a story about a character who relies heavily on gadgets, but in the Batman world, gadgets are used for getting stuff done, as opposed to being used as talking points over coffee. Maybe that’s no longer true — I haven’t been in the loop in ages. The thing with technobabble is that it reeks of implausibility most of the time and tarnishes cool things that need no explanation. You simply do not question the Gadget ‘Copter, and the notion that someone might try to explain it may or may not have just made my eye twitch. Off the top of my head, I can think of two instances where this occurred, the first being in Field Test and the other in In Darkness Dwells. Could an EMP burst stop all small-arms fire without destroying all electrical devices within a city block? It’s a bit of a stretch even just considering the first part. But! Could an acoustically triggered EMP burst stop all small-arms fire? Definitely not, because not all rounds fired from a pistol travel below the speed of sound. And do we need or want to know how Batman’s quantum encrypted radio works? That it’s a quantum encrypted radio at all? The posturing does no one any favours, because now that we “know” that the signal is bounced across multiple satellites (and who could own all those satellites?) we also “know” that the signal has to be beamed skyward, mirrored across multiple satellites potentially thousands of kilometres apart, and then sent back down where it would require a high gain (and large aperture) antenna in order to receive it. On last check, neither radio set had a small parabolic dish affixed to it, but neglecting that fact, the implied latency alone would make this setup worthless for real-time communications. And you thought that the satellite lag between a newsroom and a live correspondent halfway around the world was bad. There are, though, small details irrelevant to the story, as vaguely continuous as it is. But irrespective of the writing, the animation studios plied their craft with style, kind of like Appleseed Ex Machina. Reading this lengthy 2007 MUSICA interview, was a lot like re-watching Introducing Utada, which I went back and re-watched anyway. Juxtaposed against clips and images of her commercial success, she speaks with a vacancy that matches her listless appearance. I suppose you could read the signs to arrive at the same conclusion, being as transparent as she is, but it’s something else to have her admit it in writing, and Utada Hikaru has cemented her position as a celebrity that is simultaneously anti-social but outspoken. It makes my head spin, kind of. Along the way, the interview touches on aspects of her past three albums, but Ultra Blue doesn’t get as much mention. Her goal of “un-genre-lization” is directly reflected in the lyrics of Opening and Crossover Interlude, as well as other Exodus tracks. See her thoughts on gender and compare them to YMMWTBAM. At the time of the interview, the seeds of Heart Station were being sown. She wraps death, the abstraction of the person from the music, and that transcendental experience of being connected to everyone and everything into Teiku 5. Her world view advances no particular agenda, but it’s that mixture of resignation and cynicism that is so well integrated into Niji-iro Basu, and the album in general. I’m reminded of someone’s YouTube comment, claiming that whatever one thinks of Exodus, it had to have happened for the next two CD’s to happen. S/he is probably right: Exodus is rough yet earnest, the mark of someone with experience freed from various restraints for the first time, someone who had something to prove and went (arguably) overboard while doing so. Ultra Blue kept the passion (and Passion) but lost the roughness, the observations packaged in the richest production of the past three albums. Heart Station is decidedly less earnest, and honesty is of the cold, mostly dispassionate variety. If pushed a bit further, the music could border on despairing, and while some think that the interview is on the verge of that, I think it’s well within the purview of apathy. While there’s a chock full of other stuff worth noting, you should read the whole thing even if you’re not a fan — maybe you’ll feel the same way as well — but the last thing I want to mention is the contradiction between the artist and her music. Even though she views herself in static terms, the whole concept of defying genre is to produce work that is anything but static. That she has sacrificed everything that she is not for music wasn’t just some on the spot interview answer (like her last statements in that same video), but it’s not that true either. Rather, that she puts everything that she is not into her music, becomes everything that she is not (Hotel Lobby, anybody?) when in the recording studio or in the public eye, makes a lot more sense. Instead of floating inside an orb, these flakes, some of the solar system’s newest ornaments, dance around it. The dusting comprises active satellites and tens of thousands of space scraps—including wrenches left behind after extraterrestrial home-repair projects, bits of long-abandoned satellites, and actual trash bags stuffed with the detritus of manned space flight. 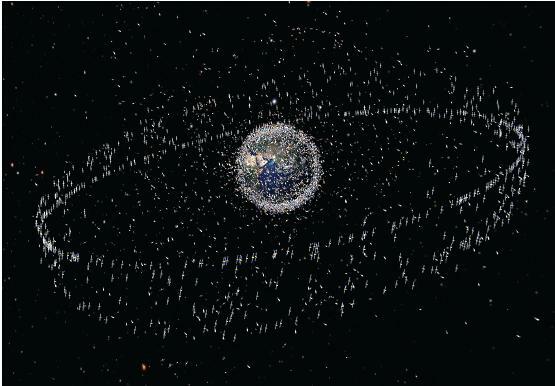 The number of pieces of junk in this orbiting garbage dump, which circles Earth at speeds up to 7800 meters per second, is multiplying; when the particles collide, they break into smaller pieces that some believe could eventually make it too risky to put satellites into orbit or even to explore outer space.